Shaggy has found his forever home. Shaggy's foster parents own a pet store, where they often bring their own Pyr. In order to socialize Shaggy and to advertise him, they began bringing Shaggy into the store. What a hit he was! We received several applications for Shaggy, and we hope that Shaggy's sad tail but stunning personality will result in the adoption of other Great Pyrs in rescue. For Shaggy himself, he will be going to a home with children and a small dog to cuddle up with, which he loves to do. Shaggy's new family own a summer camp for children. Shaggy will spend his summers being the friendly, loving ambassador for Pyrs, as he was at the store. We know that Shaggy is going to have a long, wonderful life. This is all possible due to the efforts of the rescue cat organization, Newfoundland Rescue, former adopters who jumped up to provide transportation and fostering for this lovely boy. A special thank you to Iian and Rochelle of The Animal Republic in Vaughan, Ontario, for both agreeing to foster Shaggy with absolutely no notice and for bringing him into the store and showing him off. 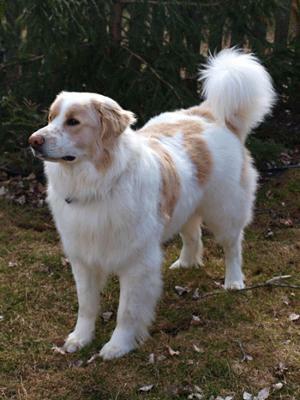 (The Animal Republic offers a 10% discount for Pyr owners! Now, that is dedicated store owners, adopters and fosters!) If you are in Vaughan, drop in and pay them a visit. Poor Shaggy. 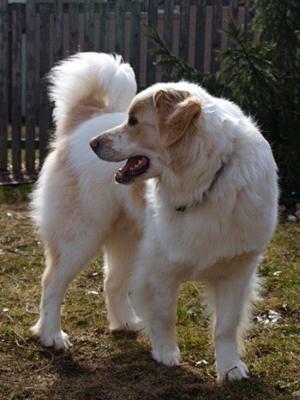 His owner died, leaving this lovely 2 year old pyr, a St. Bernard and several cats without care. A neighbour was feeding them, but after the owner’s death, we were contacted and Shaggy came into our care (see below for the “tail” of the rescue operation). Shaggy needs to have his vaccinations, which will be done before adoption. He had already been neutered. He is a bit flabby, having had little exercise, we suspect, but otherwise seems to be in good shape. His foster family tells us that he was obviously loved and well taken care of, as he is a goofy, loving dog (Velcro dog!) who seems to miss his former owner and animal buddies, but is seeking comfort from the lovely family who has taken him in. Shaggy lived with other pets, and has integrated into a home with 2 other older pyrs, an Australian sheepdog, toy dog and pet rats without a problem. He appears to have good doggie manners when dealing with animals – when the toy dog barked upon meeting, he dropped to the floor submissively and looked very surprised (is that a cat? Wow, it’s loud!) He has taken his cue from the other dogs – where to eat (and where not to eat), where to play, how to crowd into the kitchen! He could do with some refresher training, but what 2 year old pyr boy couldn’t? He is a bit “mouthy” with humans, but not biting, just kind of slobbering and doesn’t quite realize where his head stops, so he might smack you with his head/mouth when turning. His foster mom has begun working on that with him, as well as grooming him to be gorgeous. He was not raised with children, but adores them. He has a lot of energy and is quite the puppy. Likely having lived with an older person, he spent a lot of time being petted and loved, but did not get a lot of exercise or play. He may be reverting a bit to puppydom, although 2 year old pyr boys can be giant teens for another year or so! Shaggy would do very well with a family, couple or single person – preferably with another big dog or two – who had a lot of time to spend with him. As his foster mom says, this is not a dog anyone would need to give up for any reason – other than the sad reason that he did come into care. This is the perfect family dog. Is he the perfect dog for your family? Within 24-hours of receiving the call, without a rescue person closer than 3.5 hours of him, Shaggy was in his foster home. Some GPCSO readers may be interested in knowing how it happened, as it was a testament to the power of rescue and how seperate rescue teams can cooperate and help each other. Maryanne called Dr. Carol Graham, the head of GPCSO rescue, and they started going through our contact lists. 30 minutes later they both had previous adopters (pre-approved and screened) who offered to be fosters for the pyr. In the next two hours, at least 20 phone calls were made – maybe more. Poor Shaggy was 4 hours from the foster home, but the other woman who had offered to foster Shaggy (despite having a sick dog) lived half way, and she offered to drive to meet the cat rescuers organizing the rescue operation. Shaggy’s foster dad drove another two hours to pick him up. 24 hours after the call, Shaggy was hanging out in his new foster home. A huge thank-you must be given to the dog-rescue club that stepped up to take two dogs not within their mandate. The cat rescue group – wow! They were amazing! They made the contacts and organized the rescue, as well as giving preliminary temperament assessments of the dogs (loving, happy, healthy dogs, both). And of course, a special thank you to our adopters who stepped up immediately to offer transport and fostering to a dog, sight unseen. Post-script: The St. Bernard was also put into rescue, and the cats were rescued by the local cat rescue group. All are safe and awaiting their new homes, albeit separate homes. We have always felt it an honour to share our lives with these dogs. This one is no exception! He's completely housetrained, he stays off furniture, has had no accidents, and doesn't chew. We've had no need to crate him when we leave the house. He's extremely friendly and we'll be heartbroken to see him leave, but he deserves a loving family of his own. Wow! What a great team rescue effort! So nice to see animal rescue operations coming together like that for the sake of all these lovely animals! Great work by the fantastic volunteers who make all this happen and to the devoted fosters! So much love out there!